Ah Mighty No 9. 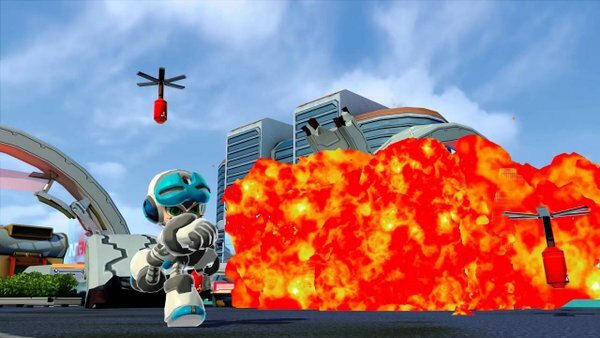 Originally touted as the ultimate successor to the Mega Man series, the game’s reputation has basically fallen further and further as the months have gone on. Delays, bad looking special effects, community mismanagement… it’s basically turned into a guide on how not to make an indie game. So when people posted about the new trailer and how bad it was, I kind of ignored it. After all, this is Mighty No 9 we’re talking about. It’s not hard to find tons of videos that make it look godawful already. But after seeing it posted as a failed example to look ‘cool’ on Reddit, I grew curious about it. After all, it’s only a Mega Man clone, right? How bad can this video really be? Are pizza shaped explosions really that bad? Oh god, what the hell did I just watch? Cause honestly, the pizza explosions are not the worst part. They’re funny, as everyone from Sonic the Hedgehog to DiGiorno’s Pizza has pointed out on Twitter. @sonic_hedgehog You're the fresh-baked pizza of gaming while the other side is delayed delivery pizza. But they’re fairly unremarkable. Bad effects in an already mediocre looking title. Who cares. Seriously, do you have to make stupid comments about the dashing, about the characters, about how ‘cool’ the damn game supposedly is? Because I’ll give you a tip; if you say something is cool, that likely means it really isn’t. This trailer comes across like a bad cartoon theme song, a vapid and desperate attempt to appeal to kids by people who have no idea what kids actually like. Think the old Hammerman theme song or just about anything in Pickle and Peanut. Either way, I can’t blane the development company for slamming the hell out of this trailer. Nor for well, just about half the internet bashing the hell out of it. Cause at the end of the day, it comes off as more cringeworthy and out of date that even the worst meme post by Nintendo of America. As something created by a group of video makers who’ve been observing ‘youth control’ through a Kaleidoscope.